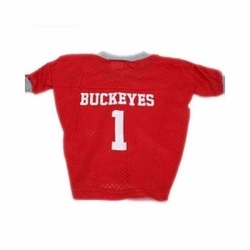 Officially Licensed Ohio State Buckeyes Collegiate Dog Jersey! This jersey is made of micro mesh material in your team's home colors. Printed team name and large 1 number on back. Dress your pet in NCAA college game day gear and support your favorite team!